August 30 in the newspaper "Arguments of the Week" was published the next false-provocative article on the Superjet. I invite you to its rapid and complete analysis. First, Vladimir Leonov ("Case of the week") complains that de, Superjet not ordered the Arctic Ocean, long talking about some mythical "tabs" in avionics. Forgetting to mention that the Arctic Ocean just does not have the right to order planes, not flying on scheduled flights less than a few years. The author calls for buying the An-148, forgetting to mention that he, too, made from foreign components. The author neglects to mention the fact that in the Arctic Ocean were already flying completely foreign Falcon-s.
As is the fact that the firm Sukhoi over enough orders and without SLO. The author goes on as usual scolds for SSJ "Excessive OF FOREIGN" and immediately began to praise the An-1×8, which not only created in the Ukraine, but also have Ukrainian engines, APU, landing gear, part of systems, wing, fuselage. What other part of the system comes Western countries, what kind of training the crew and Continuing Airworthiness Russian operators will also pay Ukraine. Further, the author writes about the "shower of budget money allocated for the Superjet." As shown Court of Auditors — It is a lie. On the Superjet has been allocated 14 billion rubles, about 5% of the money, allocated by the state for the entire civil aviation industry in the last decade. And from the end of 2010, the project budget does not receive funding. V. Saveliev: I’m three and a half years, the CEO, no one from the government apparatus, not from the administration … I will officially say — no one ever. I have an open joint stock company. I have a contract with a "dry". Many of the contracts with Boeing and Airbus, I concluded. What can I have on the pressure, what kind of car I take? I am a corporation, a state I have a major shareholder, he receives a dividend that I pay, and all the rest of my things that I can do — I carry out social programs and so on. In no airline Alitalia is not something that the blocking, but generally no stake in SCAC. No company in the world did not win all the possible requirements. Armavia simply can not pay, teetering on the brink of bankruptcy. Or to the main website to create a common mindset with heaps of small fraud? … Hourly fuel consumption of Superjet in 2011 — 2296 kg. The same indicator at the An-148 — 1968 kg. The difference — 328 kg. An-158 even more economical due to more perfect proportions. Lengthened by 171 cm fuselage was winning solution, Antonovites promise to increase fuel efficiency by 9%. Again, the author praised the An-148, desecrated SSJ. "Forgetting" to mention that said they flow shown for 98 passengers at the Superjet and 68 in the An-148. As is the fact that the AN-148 flying slower, and more correctly compare kilometer, not hourly flow. In the case of flight with the same speed M = 0.78 Superdzhet An economical, and (It still carries more passengers). But back to the numbers of the flow of the article. Even without taking into account the difference in speed — if we look only to the difference in seating capacity — it is easy to see that the An-148 consumes 29 kg per passenger per hour against 23 kg in the Superjet. And this Mr. Leon chose silence. Then the author scolds SSJ for alleged "secrecy" and praised the An-148 for the "non-secret". 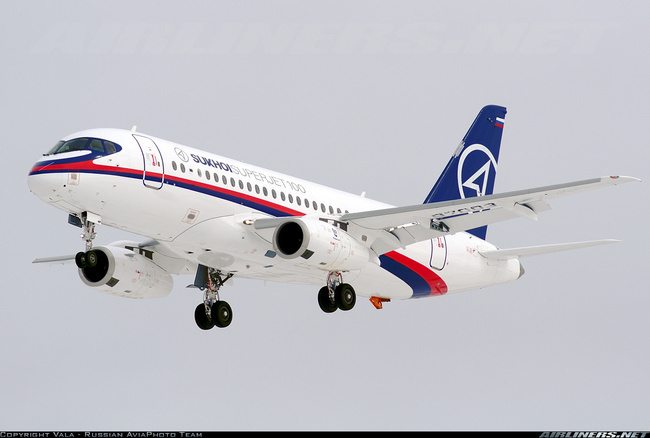 However, the AFM Superjet is publicly available on the web, whereas the present RLE-148 — not available. Flights Superjet anyone can watch on flightradar, and the An-148 does not show actual speed. Plaque Superjet can see every day in a comfortable table, touch the An-148 is known only from brochures. As well as the idle side. Website http://superjet.wikidot.comcontains hundreds of articles with details and a description of the test systems Superjet obtained from virtually firsthand. Nothing like about the An online simply do not. Kept secret … and the main indicator of the effectiveness of the aircraft in civil aviation — fuel consumption in grams per passenger-kilometer. That professional aircraft designers can only speculate: "Somewhere around 23 g / pass. km ". Figure, well, never mind. The author is mistaken again, citing anonymous unknown "professionals." Firstly, consumption Superjet not classified. Second, g / (pass * km) — not the "main" component. ter in the form r / (pass * km) is used only in one case — to demonstrate the degree of perfection of the aircraft as the vehicle and is at the maximum load. Without exception, all airlines are interested in other parameters — it is, above all, block fuel and the specific range. It is these options allow you to objectively compare competing aircraft at different load. However, they are only a guide to airlines. They take a final decision only after independent calculations on its network, which is supposed to use the aircraft, with the provision of alternate aerodromes. Only this approach allows the airline to make an economically sound decision. " Instead of a direct comparison of the author uncomfortable digits g / (pass * km), he begins to talk about the praise test pilot Peter Collins, who pro-rate any word and did not say. Another lie. Test drive Superdzheta conducted Numerous pilots experts EASA, and not one of the pilots (specifically called to Kiev with advertising purpose). And feedback from them were no less enthusiastic. "Armavia" — the only foreign buyer Superjet — refused to pay the two previously ordered aircraft, "since they do not meet the necessary criteria of exploitation." Apparently, they had problems with the first car, and they contracted for the Farnborough Air Show a couple of brand new Boeing 737. Armavia was very pleased with the operation of the Superjet until recently. However, apparently, the airline is trying to solve its financial problems by GSS. We Armavia took 5 ayrbas I suppose, too, because "they do not comply." There is no "order a pair of brand-new Boeing 737" no. In reality, Armavia took in the "wet" leasing ancient wherein not even repainted them (No money). Superjet is under arrest at the airport "Ramenskii" in Zhukovsky, where he arrived on repairs. By the way, is not the first time. Again deception. Superjet flew in the form of regular maintenance. It is normal for any type. Under the "arrest" it is only because of "Armavia" failed to pay maintenance liner. Experts, more or less familiar with the project at an early stage warning — will not supersamolet, locomotive aviation industry, and the usual liner, comparable in performance to the foreign aircraft twenty years ago. fuselage on the tests showed a lack of strength, and had to be strengthened. Where only looked project consultants from Boeing? Now we need to do a version of «Long Range», which has not been canceled, in fact, customers are waiting for this car. Take-off weight LR goes to the area of 49 … 50 tons. But under this model, and we need to strengthen the design, but, I repeat, it is local, local amplification. They take into account the results of static testing machine at TsAGI and resource in SibNIA. And these local gain associated with the resource and static, is a normal process. Here is an example of our own stories. After the war, launched the famous Tupolev Tu-16, which became not only our main bomber, but the prototype of the Tu-104, it is no secret that the machine is run twice. First plane designed, say the "old way" under the 100% strength, was very heavy and given LTH did not give. Then clever AA Archangel came up with the idea: instead of what would be "lick" the extra pounds with pereuprochnennoy design, design a plane for smaller reserves of strength and experience to 100% and the results of tests to determine the places of local reinforcements. Did so. With the machine was removed several tons of weight! Since aircraft trying to design a minimum margin, in order to minimize the weight of the structure. And I want to note that we have a weight-optimized achieved. That’s why we are strengthening it locally by individual seats. It says in part because we have the car on a static wing broke at 99% of rated load, and this is a great result of prochnistov and designers. To say there is not that the aircraft turned hard, on the contrary, he got easily. It is lighter than all of its competitors, even physically (EMB-190 is heavier than 700 kg), and given the size of our fuselage, in respect of the specific even easier. Immediately came to the fore the lack of traction from the French in fact SaM-146 engine. Author cheating thrust of the engine is more than enough, and on the train climbs Superjet much livelier than the same AN-148. Rybinsk plant with this engine simply framed — old design, base, gas generator, developed in the late 50? Ies. False. SaM-146 engine is the newest development in this draft class in the world, is based on the latest gas generator DEM21 (late 90’s). Vladimir Leonov lied for 40 years. Again deception. SaM-146 has already shown on the stand more than 8 tons of thrust, another thing is that the increased traction is simply not needed, and so the engine is more than adequate for the Superjet, allowing him take the train FL300 in just 12 minutes. The engine is already Version 1s18 with an increase of 5% traction. Fuel consumption by modern standards too big, there were cases surging engine, posing a threat to flight safety, especially during takeoff and climb — with surging automatic engine knocks. e in flight (only on land, at trial). The author, praising rival modestly silent about that and he there have been problems, IAC and even sent a letter to the manufacturer ultimatum. And about the price of engines — another deception. Instead cherish their own producers, fly on domestic aircraft, again planning screwdriver assembly "superliner" on the basis of import. Not hard to guess who order such articles. PS Here’s the author: http://www.aviaport.ru/images/archive/138, 268105 / receives a prize from the Ukrainian company Motor Sich. As well as the author of another false in Encyclopedia: Olga Bozheva.